SHINee’s Minho has enlisted today on April 15. The idol had previously announced the news through his agency, SM Entertainment had previously stated he wished to enlist quietly without any goodbye events however, many fans showed up to say goodbye to him. He was accepted to the Marine Corps last month and became the first SM artist to join the Marine Corps. This makes him the third SHINee member to enlist, Onew and Key are already serving the military. This also means that Taemin is the only remaining SHINee who hasn’t enlisted yet. 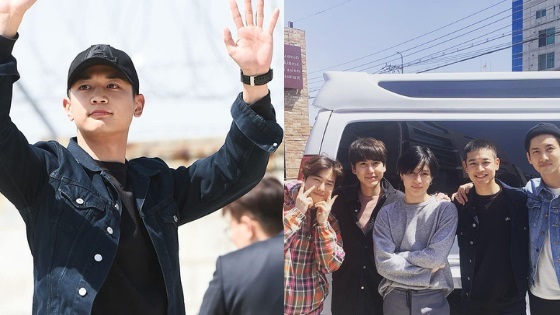 SHINee’s Minho had a lot of good SM family friends to send him off, EXO’s Suho, TVXQ’s Changmin, Super Junior’s Kyuhyun, and SHINee’s Taemin were there to send him off. TVXQ’s Changmin posted a group photo to his Instagram wishing him a safe return!